When you book with us, you climb with us. We operate and control every aspect of our own climbs. We don’t just take bookings then sub-contract your safety and enjoyment to someone else. As the map above shows, there are multiple routes by which to summit Mt. Kilimanjaro. 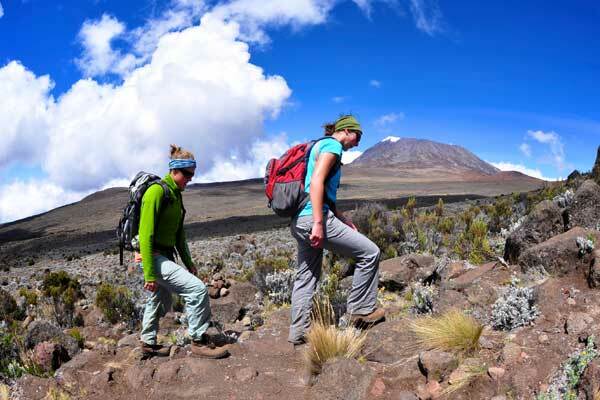 The duration of the climb is typically related to your budget and physical fitness; a duration of 6 – 7 days along either the Marangu or Machame routes is the most popular choice. At the bottom of this page you can see all of our different route options in detail. We highly encourage you to click the ‘Contact Us‘ button and we can talk through your trek together! Great if you want the company of other climbers. Our open groups are limited to 12 climbers and are all guaranteed to run. We have open climbs starting every Saturday and Monday, except in the rainy seasons. For your own personal adventure. Your choice of dates, route and options; your own team and as a result the highest chance of success. Perfect for a family, a school group or a group of friends or business colleagues. We have a unique charity-oriented approach to climbing Kilimanjaro that holds several benefits like no minimum fundraising, ultra-low deposits and tailored climbs to fit your exact requirements. After your climb we can arrange a private safari to see the incredible wildebeest migration, or to the mystical Ngorongoro crater, or to a Zanzibar hotel for you to chill out in tropical paradise before flying home. Our porters take care of you. So we take care of them. We exist to uplift the people that will take you to the top. Tanzania is among the poorest nations in the world with a per capita annual income of only 700 USD. Guides and porters are some of the least paid workers in our society. Many other trekking operators take advantage of this and pay their guides and porters very minimal wages (as little as 3 USD per day). We however seek to empower each other. You can trust that we pay at least twice the average local salary from the fees you pay us without charging you more. Let us take you to the top and at the same time feel great about providing for those in need. Looking for how to best prepare physically for the trekking? Look no further than our Preparation Page. Check out our Packing List to help you pack correctly — you can always rent from us as well! How tipping works when it comes to trekking in Tanzania: Tipping Guidelines. We also organize other mountain treks like Mt. Meru and Ol Doinyo Lengai — just ask us about them! In your message please include the estimated number of people, the trek(s) you are considering and the range of dates you have in mind. Thank you!